Zimbabwe is blessed with such diversity and beauty that it is sure to fulfil the dreams of any traveller planning to visit this gem of Africa. Firstly, the legendary and impressive Victoria Falls, discovered by David Livingstone. Further upstream, Lake Kariba, a huge inland sea decorated by half submerged forests. To the east, the Highlands, cool enough at certain times of the year for the grass to be covered with morning frost and a paradise for hikers and fishermen alike. To the west another world awaits you: chaotic granite rocks forming the Matopos Hills which so enchanted Cecil Rhodes that he wished to be buried there after his death. To all this, add the ruins of ancient civilizations, massive stone buildings reflecting a culture whose mysterious roots are lost in remote origins….and you have a fascinating multi-faceted country. Relive a legendary era ! Capture the spirit and charm of the legendary era of early explorers, from the comfort of an authentically renovated steam train. 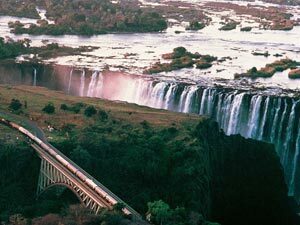 At sunset the train will stop in the middle of the bridge over the Victoria Falls to offer a breathtaking view. A special moment that calls for a glass of champagne before continuing on to the Zambezi National Park, where, with a bit of luck, you may witness an exciting evening hunt. Quite simply…..spectacular! To curb the decline in the number of lions, an association has developed a program that will eventually rehabilitate the descendants of these felines into their natural habitat. To finance this, the association offers to “walk with lions” of the first generation. 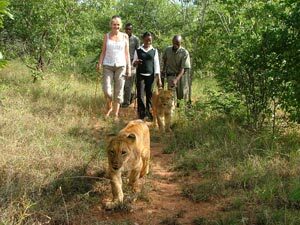 The walk takes about 1 hour 30 in the company of “young lions” … an awesome experience! Declared a World Heritage site, Batoka Gorge is a spectacular sight, with its black cliffs dropping straight down into the churning waters below. 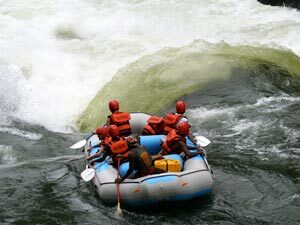 At this section of the great Zambezi River many adrenaline pumping activities are offered. Depending on water levels your inflatable raft or kayak will descend between eighteen to twenty-three rapids. The distance between the rapids offers time to breathe and relax whilst enjoying the scenery and getting ready for the next challenge waiting around the corner! 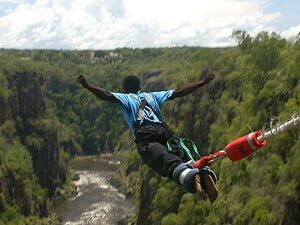 Victoria Falls Bridge [111 meter high] crosses Batoka Gorge and is the perfect launch pad for bungee jumping. The ultimate adrenaline rush!